Improve your chance of passing with MedExamsprep online NEET free exam resources. Throughout your preparatory phase, you need to remember only one-word “FOCUS”. Trust us it is difficult but it is definitely POSSIBLE with NEET PG free exam resources. NEET Free Test series is a fantastic online portal for the NEET PG entrance exams. You can pass NEET PG exam on the first attempt. The best feature is the simulation. 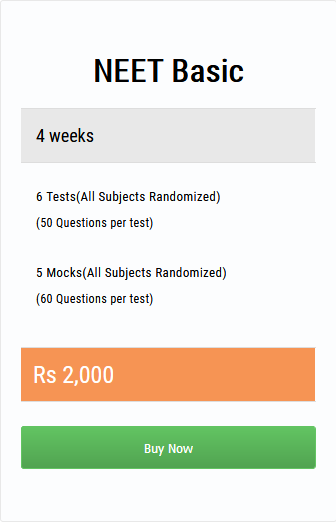 The NEET PG free sample questions and NEET PG free practice test papers are similar to what appears in the real exam, the language used, the length of questions etc, and the site helps candidates to prepare from day one. Take your exam confidently with best NEET PG free Test series online. You can very helpfully track your revision progress. It is also great value for money! MedExamsprep’s type of ‘question spotting’ can help to point candidates towards types of topics that are commonly encountered in the NEET PG exam and also acclimatize you to the style of question that you are likely to encounter. It is a well-accepted fact that students that are familiar with the question style and have practiced these NEET PG free practice test papers/questions ONLINE do better in the NEET PG entrance exams at the first attempt itself.